Redco™ FRP Grating provides durability with extremely high strength and stiffness. Due to its high load capacity it can be used with confidence in structures where high load and wide support spans are required. Redco FRP Grating is also lightweight (80% lighter than steel), corrosion resistant, and non-conductive making it ideal for applications where electrical current or chemicals may be present. Redco™ FRP Grating is low maintenance and has a low cost of installation. Redwood Plastics and Rubber offers eight resin systems for its molded grating to accommodate different applications to ensure optimum utilization of grating. Type FG-30 is manufactured using a premium food grade polyester resin containing no harmful ingredients and is certified by the resin manufacturer. Each panel is post cured and detergent washed prior to shipment. This grating possesses a flame spread rating of 30. Type CFR-25 is an orthophthalic polyester resin with a flame spread rating of 25 or less providing moderate chemical resistance. This grating is perfect for use in water/wastewater applications, light industrial applications, and in the wavezone areas of offshore platforms where the environment is moderate. Although Type CFR-25 is the least chemical resistant resin, it still offers superior performance to traditional flooring products such as steel, aluminum and wood, and is the most economical resin available. Standard colors available are: dark gray, green and yellow. Other colors are available by special request. Load capacity charts for uniform load, concentrated panel load, concentrated line loads. A standard line of accessories is available for installing REDCO™ MOLDED FIBERGLASS GRATING panels. Accessories include REDCO™ FIBERGLASS stair treads, REDCO™ stair tread covers, panel hold-down clips, panel connectors, elevated floor legs, curb angle, solid surface options and sealing kits. 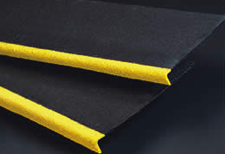 DURATREAD™ covers are available in thicknesses of 1/8″ and 1/4″. Standard depths are 8″, 9″, 10″, 11″ and 12″. All stair tread covers are available in 12′ lengths. Other lengths and depths are available upon request.